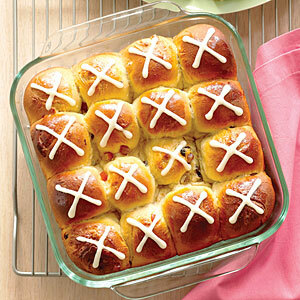 There are a number of special food delights associated with Easter. Certainly chocolate bunnies, Cadbury crème eggs (be still my heart! ), those sugary marshmallow peeps, jelly beans, and the chocolate covered Easter eggs we discussed last week are some of the first to come to mind. You can also find a lot of cute Easter treats to make for kids on Pinterest*, one of my addictions, such as rice krispie “nests” filled with jelly beans or peeps, creatively decorated coconut cakes made in the shape of bunnies or even decorated with more peeps….you get the idea! 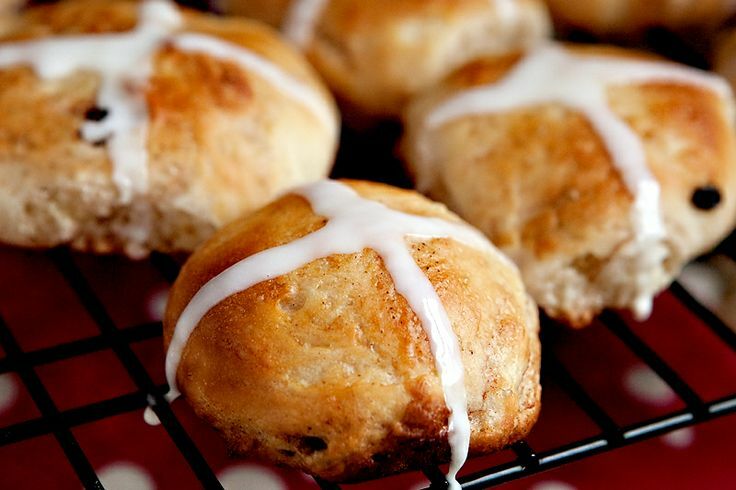 But one particular item I’ve always enjoyed at Easter is the Hot Cross Buns. My mother would buy them every year, as soon as they were in the grocery store, which was usually about a month before Easter Sunday. And as soon as Easter was over, once the stock was sold out, you couldn’t find them again until next year. It’s funny how my mother, who was a wonderful cook, never tried to make them herself. Most likely it would’ve been fairly easy, especially using her special cinnamon bun recipe. Next year I’m most likely going to be trying all kinds of those creative treats I mentioned before, because we’ll have our granddaughter next Easter, since that’s what grandmothers are supposed to do. But for right now, I’m going to try this recipe that I found years ago and just filed away in my “things to make sometime when I have the desire” recipe box. It sounds good, and it also sounds fairly easy. And I like both! And don’t be put off by how long the directions seem to be. They are very similar to how we make my mother’s cinnamon buns, and those are easy! In bowl, mix together 1/4 c of warmed milk and 1 tsp of sugar. Sprinkle yeast over the milk and let set 5-10 minutes, til foamy. In large bowl vigorously whisk together 3 c flour, salt, spices, and 1/4 c sugar. Make a well in the flour mixture and add yeast mixture, softened butter, eggs, and remainder of milk. Mix ingredients until well blended (will be “shaggy” and sticky). Add fruit and orange zest. When ready, take dough, and roll into a log shape and cut into two halves, leaving one half in bowl until ready to use. Cut dough you are using into 8 pieces. Take dough and form into mounds, placing them 1 1/2” apart on baking sheet. Cover mounds again with plastic wrap and let rise again until doubled in size, about 30 minutes. Preheat oven to 400. Whisk together 1 egg and 1 tbl milk. Score tops of buns in cross pattern with a knife (deeply cut so that the cuts will stay visible after baking). Brush egg mixture on top of dough. Bake on middle rack in over 10-12 minutes til lightly browned. Remove from oven and cool in pan for a few minutes, then transfer to wire rack to cool completely. When buns are totally cooled whisk together 1 tsp milk and 3-4 tbl powdered sugar, adding sugar until you get a thick consistency. Place in plastic bag and snip off corner to make pastry bag. 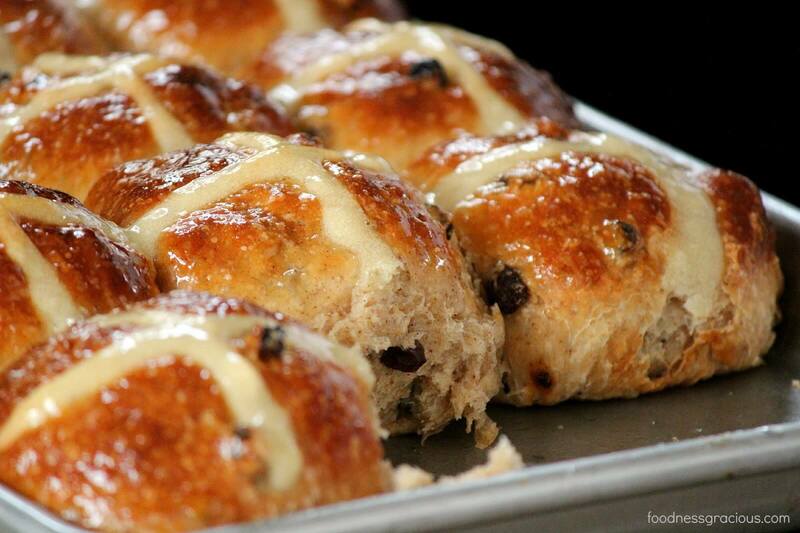 Pipe lines across the top of each bun to make a cross.